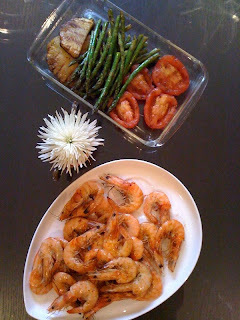 Healthy Compromises: 10-min Healthy Meal: Throw another shrimp on the barbie! 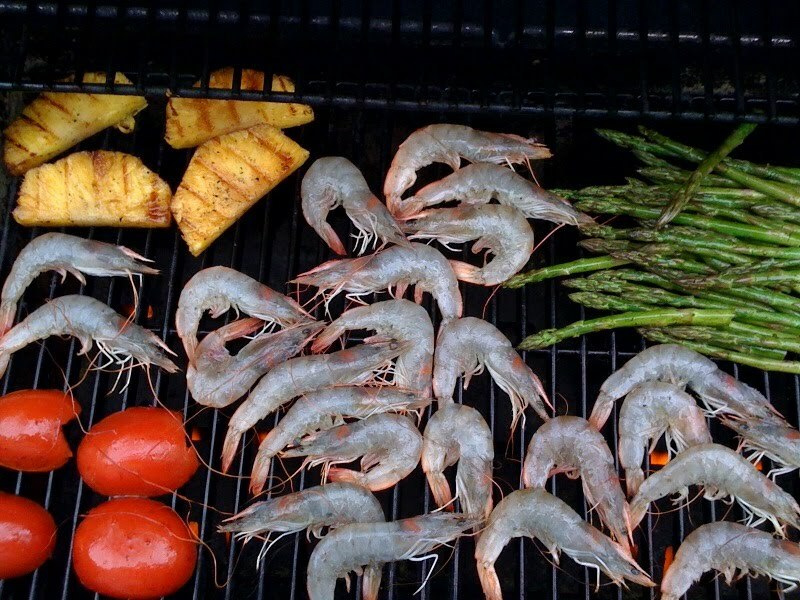 10-min Healthy Meal: Throw another shrimp on the barbie! Yes, maybe I just wanted to yell out, "Throw another shrimp on the barbie!" in an Aussie accent for my neighbours. But besides that, shrimp is one of the quickest and healthiest foods to grill; shrimp is a great source of lean protein, high in vitamin D, B12 and selenium and low on the food chain to boot. Gotta love BBQing in the summertime, but really with us Canucks, no weather really holds us back. I know from personal experience, Canadians have never let a foot of snow prevent us from digging out the barbie, putting on a parka and grilling in sub-zero temperatures. The weather today was a little brisk compared to the warm spring we've been having, and even started to hail part-way through. The worst cooks amongst us men, will enthusiastically BBQ anything at anytime - or at least try our very best. Me man...me see fire...me must cook! The beauty of the grill is that almost anything tastes better grilled. Tonight was an easy and delicious meal, done in about ten minutes. Got some large fresh shrimp (smell them to make sure they don't smell fishy) and tossed them in sunflower oil, salt and cracked pepper. Then, drizzled sliced pineapple, halved tomatoes and asparagus with sunflower oil, balsamic vinegar, salt and cracked pepper. Then, I popped the veggies and pineapple on the grill (on high-heat) first for about 5 minutes, then threw on the shrimp. Shrimp only take 2-3 minutes per side...and the beauty is that they tell you when they are done. When they turn a nice rich pink with hints of golden-brown with no sign of translucency, flip em, and do the same for the other side; watch them carefully - overcooked seafood tastes like rubber. Veggies are done when they turn a golden-brown, about 5 minutes per side. Below is the finished product. I am far from a natural in the kitchen, but I know I prepared a good meal if the wifey is mmMM'ing throughout the meal! Craving beer or wine after work?